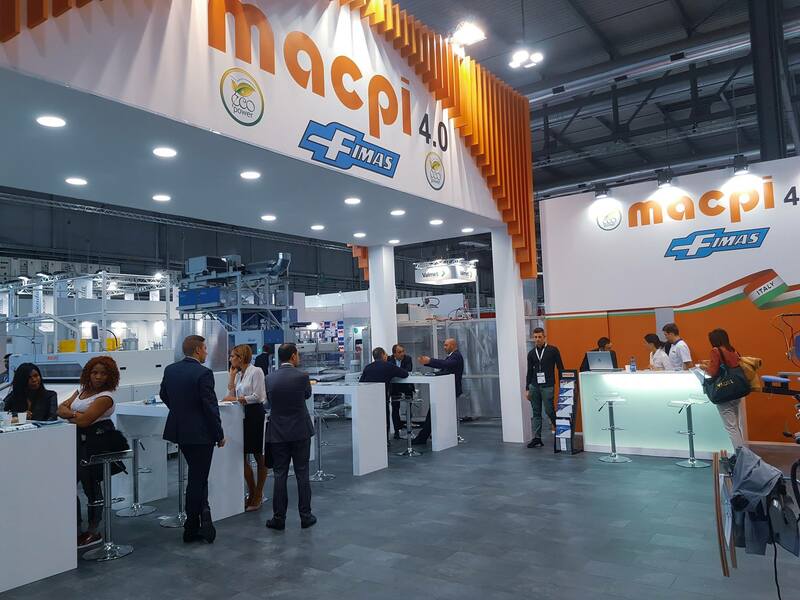 Great success obtained by Macpi and Fimas at EXPOdetergo International! Milan, from 19 to 22 October 2018, four intense days rich in business appointments and news, a surprising weekend in terms of the number of visitors attending the show. The booth of reference for the entire ironing sector drew attention of numerous clients both industrial and commercial laundries; with more than 300 sq. 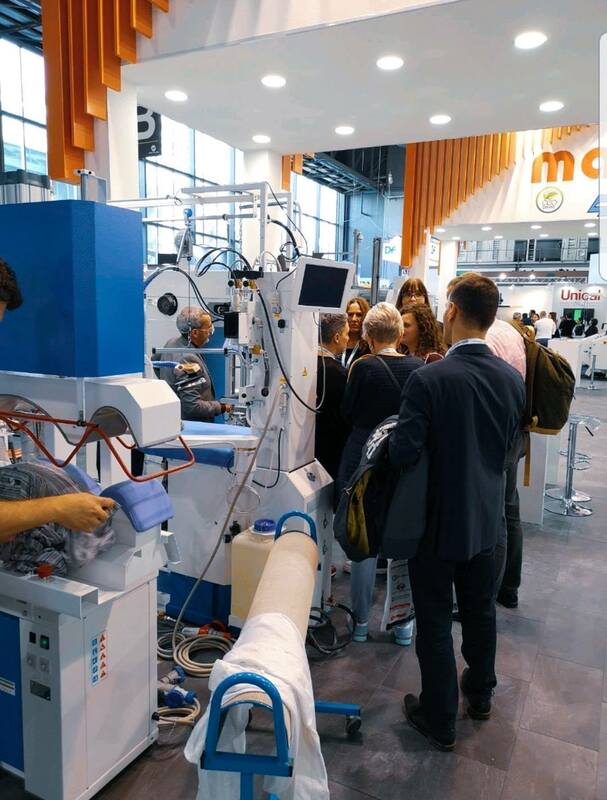 m. to their disposal, Macpi exhibited all the latest technology designed for hospitals starting from automated machines for uniforms and pants finishing to accessory units for manual ironing. 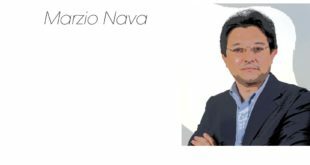 The consolidated position of the business in the Italian and European market has opened important new scenarios in the sector thanks to the innovation and the attention given to products and services that have always characterized Macpi. 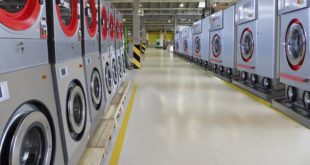 In particular, the study on the latest models has focused on the ergonomics of the machines: thanks to the telescopic finishers, reclining boards and mobile work stations, it was possible to obtain a significant reduction in physically demanding movements of operators, which results in more comfort and different personnel turnover rate in laundries. The perspective of 4.0, adopted for some time now, allows to interface all the machines through central system of management. It is able to extract data and obtain advantageous elaboration of figures in terms of production increase and efficiency. Today, digitalization is unavoidable. 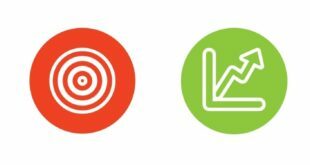 It allows to obtain correct analysis and optimal control of all the work stages; it brings significant advantages to businesses as it allows to gather the data that used to be inaccessible; it helps to carry out detailed analysis of production processes. 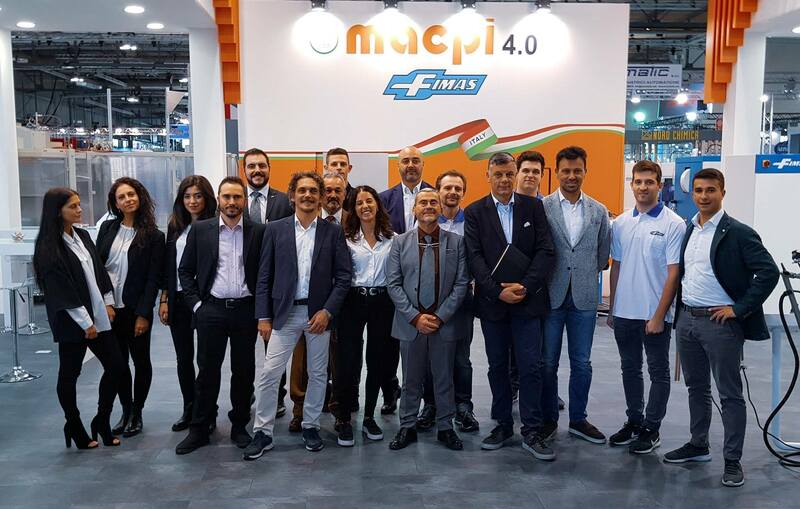 Fimas that was founded 30 years ago and today makes part of the Macpi Group, obtained an outstanding success during the exhibition thanks to their medium high-end product range whose objective is to guarantee the maximum satisfaction of clients by presenting them with better performing and higher quality machines. The new 298 model for shirts finishing directly from “the house” in Vigevano triggered great interest thanks to its high velocity, heated steam plates for the body, cuffs and yoke finishing. However, its main point of strength is the automatic loading and unloading of garments which contributes to the increase in productivity rate. Such an innovative solution guarantees the result of 100 shirts ironed over one hour with the intervention of just one operator. The real and tested figures come from numerous laundries in Italy and abroad. The trend we observed at EXPOdetergo International undoubtedly involves the producers who are able to meet the requests for innovation, customized products and services, that today constitute the winning formula in the more and more competitive market. Choosing a reliable partner, able to handle specific requests, modifications and customization leads to the differentiation of the product which contributes to avoiding the Dutch auctions that are against any logic for developed businesses, consolidated Made in Italy manufacturers that aim at guaranteeing quality and innovation of offered goods. Obviously, also the service has become essential just like the spare parts always ready to be quickly delivered. In the meantime, the attention switched to the investments in the long-lasting machines that bring the maximum satisfaction to clients. 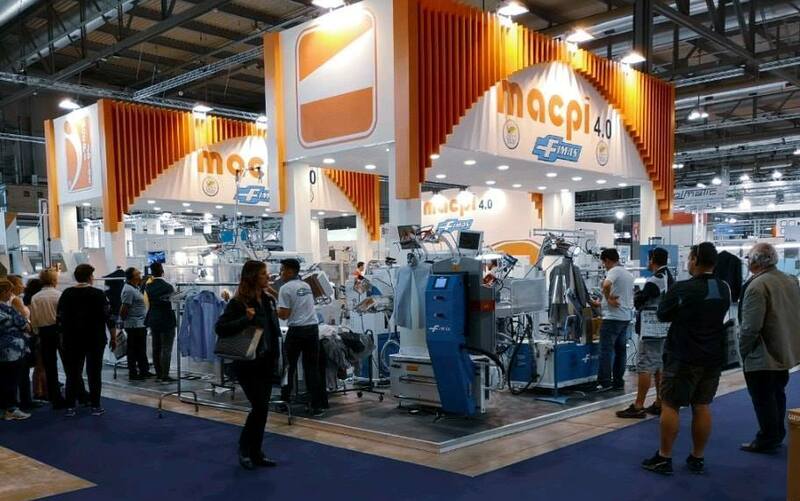 The many collaboration agreements that Macpi has established over years with the main key players of the sector bring an advantageous and smart development inside the laundry world; as far as industrial laundries go, the machines by Macpi have been provided with the possibility of interfacing with the most sophisticated systems of transport allowing for working each garment “on a hanger”. Innovation that, developed over years, has made of Macpi a leading producer of ironing machines for anything that needs to be finished or pressed, both cotton and any other mixed fabrics. Behind all this, there has been a solid, 60-year-old, consolidated group, known all over the world for their excellent technology. A proud, Italian industry with its R&D, design, technical assistance and “vertically made” production departments whose objective is to guarantee the best possible quality at all times. 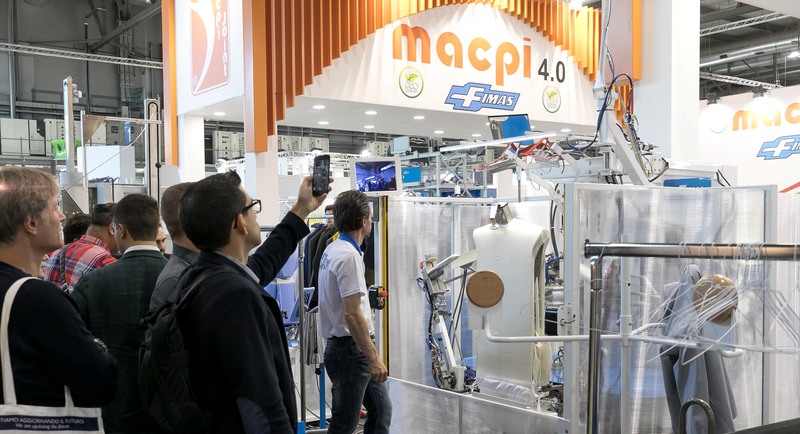 Fimas, on the other hand, has been always following the same company policy that fully reflects Macpi’s ideals, with its production and product innovation team, always alert to the market needs. EXPOdetergo International 2018 has once more obtained results above the expectations. The high attendance registered at the show consolidated it as an essential, not to be missed, sector Event of the European panorama. Great gratification for the Macpi Group and a great pleasure, as always when looking at the satisfaction of the clients and the esteem of business partners if not the enthusiasm that this edition of the show reflected. 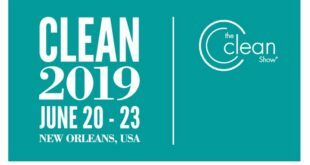 While looking forward to the next edition of this leading world textile care show in 2022, these sensations are definitely going to accompany and stimulate the productivity and the design creativity of Macpi and Fimas.